This story was updated at 11:42 a.m. EST. A major solar flare erupted from the sun late last night (March 4) sending an explosion of plasma and charged particles hurtling toward Earth. The flare was an X1.1-class solar flare and exploded from the surface of the sun at 11:13 p.m. EST (0413 GMT March 5), according to the Space Weather Prediction Center operated by the National Weather Service. X-class flares are the most powerful type of solar storm, with M-class eruptions falling within the mid-range, and C-class flares being the weakest. The X-class flare unleashed a wave of plasma and charged particles, called a coronal mass ejection (CME), into space. Experts at the Space Weather Prediction Center said the CME will likely miss Earth, but they remain alert for minor geomagnetic storms beginning late Tuesday (March 6) and lasting through Wednesday (March 7). "According to analysts at the Goddard Space Weather Lab, the CME will probably miss Earth, although it will hit Mercury and Venus." the website Spaceweather.com reported in an alert. "Even if this CME misses, high-latitude sky watchers should still be alert for auroras in the nights ahead." Several spacecraft, including NASA's Solar Dynamics Observatory and the Solar Heliospheric Observatory (SOHO), observed the extreme ultraviolet flash from the X-class flare. 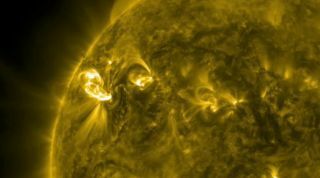 This latest solar flare is the second X-class sun storm of 2012. The first event occurred on Jan. 27 and registered as an X1.7 on the space weather scale used by astronomers. When a powerful X-class flare is aimed directly at Earth, it can sometimes cause significant disruptions to satellites in space and power grids and communications infrastructure on the ground. Strong flares and CMEs can also pose potential hazards to astronauts on the International Space Station. These radiation storms can also amp up normal aurora displays (also called the northern and southern lights) for lucky skywatchers at high latitudes. Last night's solar flare burst from a big sunspot region called AR1429, which has been particularly active since it materialized on March 2. This same region produced an M2-class eruption yesterday, which also triggered a CME that is currently approaching Earth and could deliver a glancing blow tonight at around 11:30 p.m. EST (0430 GMT Tuesday, March 6). As a result, when the CME from last night's X-class flare arrives at Earth over the next day or two, the planet might already be in the midst of a geomagnetic storm, according to Spaceweather.com. This report was updated to include more refined predictions about the path of the CME and the resulting geomagnetic storms.